Welcome back to all pupils. A new school year has begun and all the members of the science department are well underway in their teaching. The Junior Science Lab has been fitted with an interactive whiteboard over the summer months. This piece of equipment allows for a interactive learning environment. The whiteboard is connected to a computer and it's display is directed onto the board. 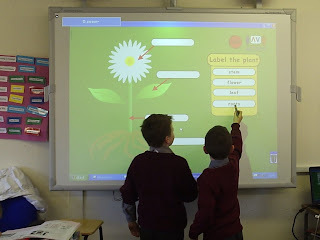 However, the board has a touch screen interface so pupils can click, tap and draw on the board and material saved onto the computer. Pupils can also engage in interactive touch screen games and quizzes. Below is a photo of how the board can be used in lessons.